Later today, I’ll be headed off to play with a giant tire. 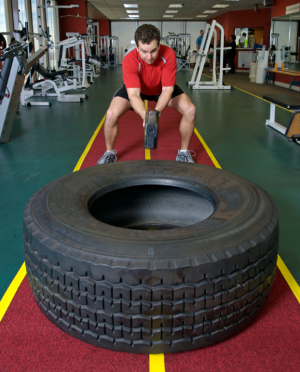 First will be sledgehammer swings against the tire, then jumps onto the tire, then tire flips, and finally, tire jumping lunges. And while you don’t need to have a giant tire to develop power (and this actually would be a risky way to start if you’re not used to intense power workouts), you should certainly consider including these type explosive and powerful workouts in your triathlon off- season. In just a moment, I’ll explain why you should consider including power workouts in your off-season – but first it’s important to understand why power is important. When you’re riding your bicycle, or swimming, or running, or weight training, or doing anything else which requires a muscle contraction, you’re engaging in “motor unit recruitment” or MUR. Basically, MUR is the activation of a muscle by recruitment of individual motor units within that muscle to accomplish a contraction. Since a muscle consists of a motor unit and all the fibers that that motor unit “activates”, the more motor units you can recruit the more muscles you can use for any specific contraction. The way that you recruit a motor unit is via the activation of a motor neuron, so the more motor neurons you can activate the more motor units you can activate and the more muscle fibers you can actually use. Herein lies the problem with limiting yourself to endurance training or not including power in your workouts: motor units are generally recruited in order of the smallest to the largest motor unit, from slow twitch muscle to fast twitch muscle, and the higher the force or the faster the contraction, the more motor units and the more fast twitch muscle you recruit. The ability to contract more motor units and use more fast twitch muscle allows you to go farther with each step, or to produce more power with each pedal stroke. If you’re just doing “long, slow, distance” training, then you never really activate a large number of motor units or fast twitch muscle. Power training allows you to activate more motor neurons, more motor units, and more muscle fibers. But why include power training in your off-season if you’re a triathlete? The answer is simple: once the “real” season rolls around and you’re swimming, cycling and running significantly more, you tend to experience both central fatigue (literally your brain and spinal cord get “tired” of activating muscles) and peripheral fatigue (you run out of ATP, glucose, creatine, and other metabolic products necessary to generate strong muscle contractions). As a result, when you do a power workout, it tends to be lower quality and yield less results, while also placing you at a slightly higher risk for injury. In contrast, your power workouts in the off-season can be dynamite, and you can go harder with less risk of injury. Lift fast. It doesn’t matter whether you’re doing body weight power workouts or power workouts with resistance (medicine balls, kettlebells, dumbbells, barbells, a tire, etc.) – you need to lift the weight as explosively and quickly as possible. Once you can’t move fast anymore, a power set is done and you recover, rest or work a different body part until you can generate high power again. Choose “big” exercises. Doing calf raises very quickly will generate decent power in your calf muscles, but isn’t a great use of your time. Instead, choose multi-joint exercises, like medicine ball slams, jump squats, and even more traditional weight lifting exercises like cleans, snatches and deadlifts. If you need exercise videos, visit http://pacificfit.net/exercise-library/. Lift first. A light cardio warm-up is fine, but don’t do a power workout after you’ve done a long indoor spin routine, a tough winter run, or a hard set in the pool. The more fresh you are when you lift for power, the better your form will be, the faster you’ll lift and the more benefit you’ll get from the workout. Be safe. If you’re not used to moving heavy weights quickly, then begin with light weight workouts or body weight workouts, rather than going straight to sledgehammers and giant tires. The faster you move, the easier it can be to injure yourself, so be safe and use good form! I hope this article was helpful for you. For more unconventional style “circuit” workouts that are both short and powerful, check out http://www.TheStrongTriathlete.com. For a more traditional, full-season strength training routine that includes many power workouts, check out my book “Weight Training for Triathlon: The Ultimate Guide” on Amazon.